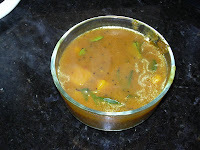 Vidya this recipe is tooooo good with pumpkin. I have that in my fridge will try this. I love the spices which u added in this. lovely. Woooow ! vathakozhambu is my all time favorite vidya looks perfect n delicious. Something new to me. Looks awesome. my favrt kulambu vidya.sounds tasty with potato and paruppu thuvayal. I have something for u in my tiny world come and have it dear. looks sooperrrrrrrrrrr. looks yummy & delicious..